High tide rolling wave storm sailing! Acadia offers up some pretty nice conditions on big days, but they don’t happen very often, even less so recently it seems. 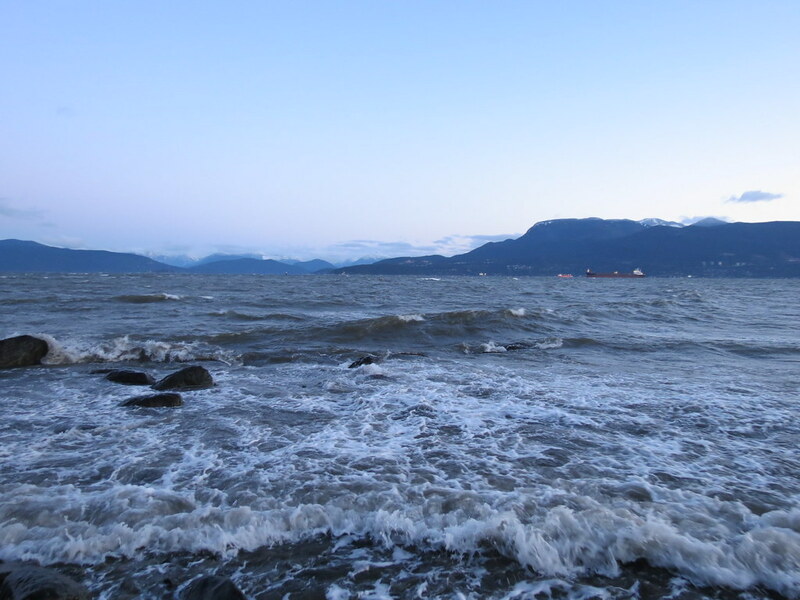 Click here to read more on wind, tide, and current patterns in English Bay. 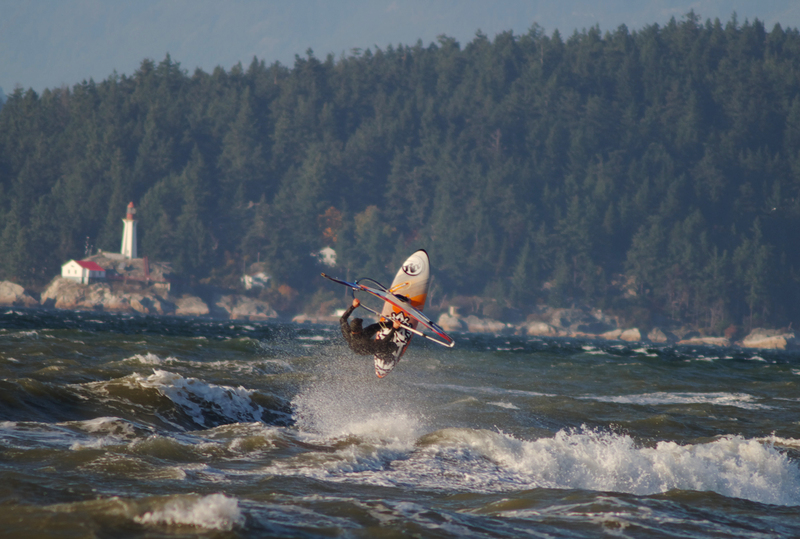 Water conditions at Acadia can range from flat water on shallow tides to large rolling swell with nice jumping ramps presented in both directions (port – photo credit: Tony - outbound and starboard inbound – photo credit: MEnglish). 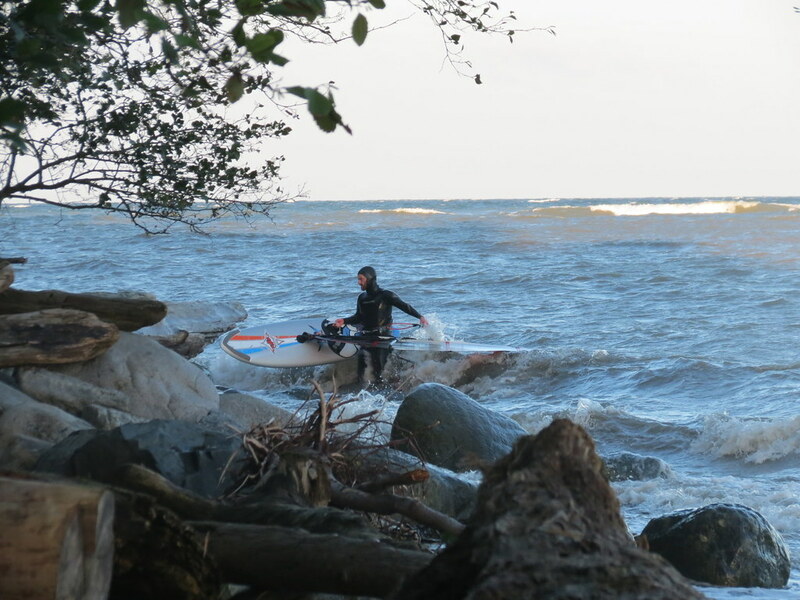 The bank (photo credit: Evan Leeson) extends about 1 km out from Acadia Beach – this is the section that produces the best waves with stronger winds. Beyond the bank you can get a deep water rolling swell. 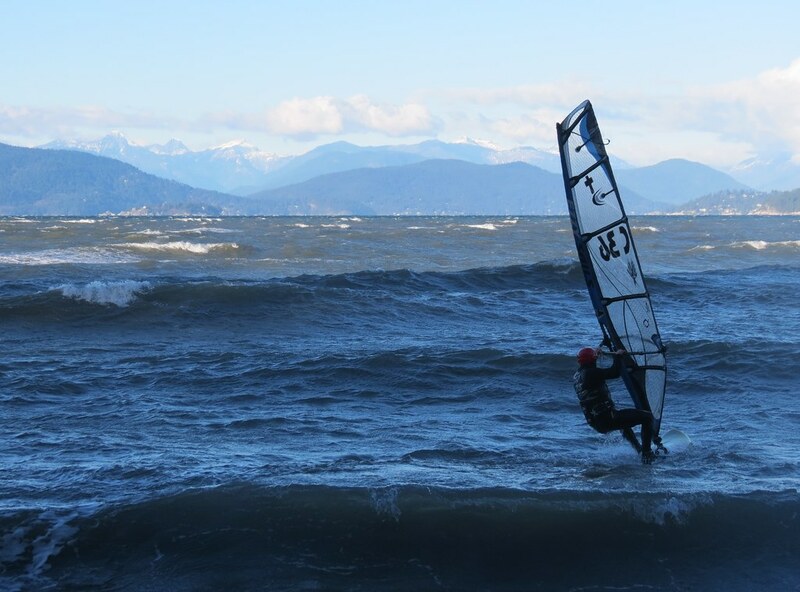 English Bay is about 6 km across from Acadia north to West Vancouver and there is over 6 km of water to east to Kitsilano Beach providing lots of great opportunities for downwinders on big days. 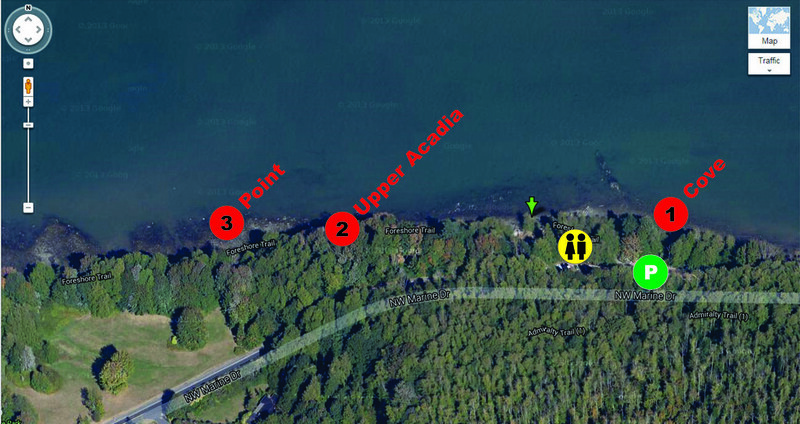 Most people will look for a tide depth of about 2 m or more to sail Acadia, but it is possible to sail ‘Upper Acadia’ (the western end) with less water. The water depth is fairly consistent north-south across the bank but the bank does tilt a little east-west with the west end being slightly deeper. 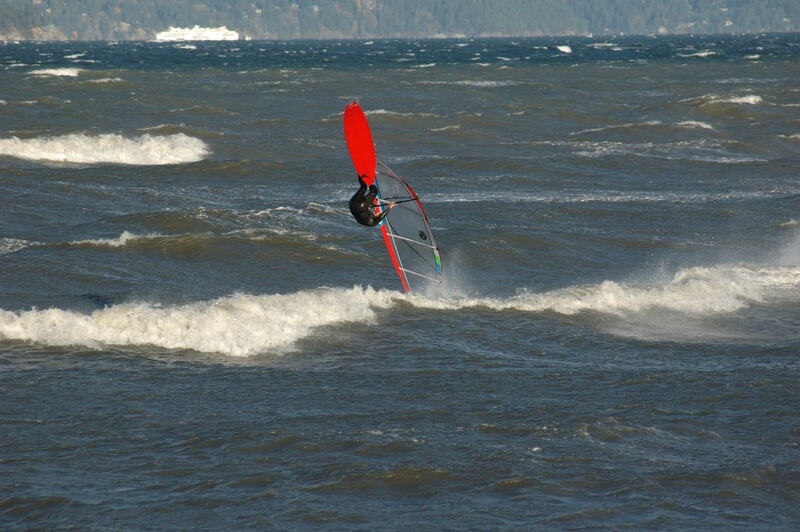 There are three windsurfing launches at Acadia and they all are sideshore launch. 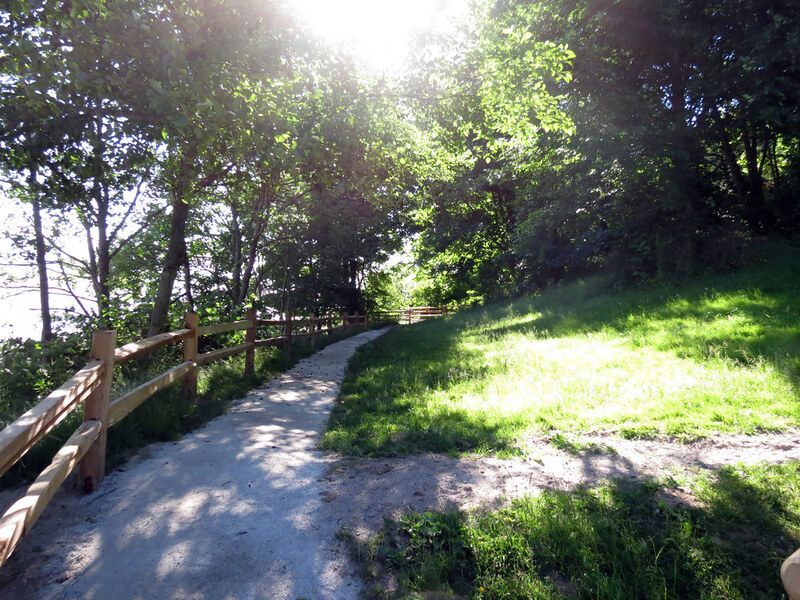 Cove: Down the hill and turn right and walk along the path to the cove located to the east of the parking lot. 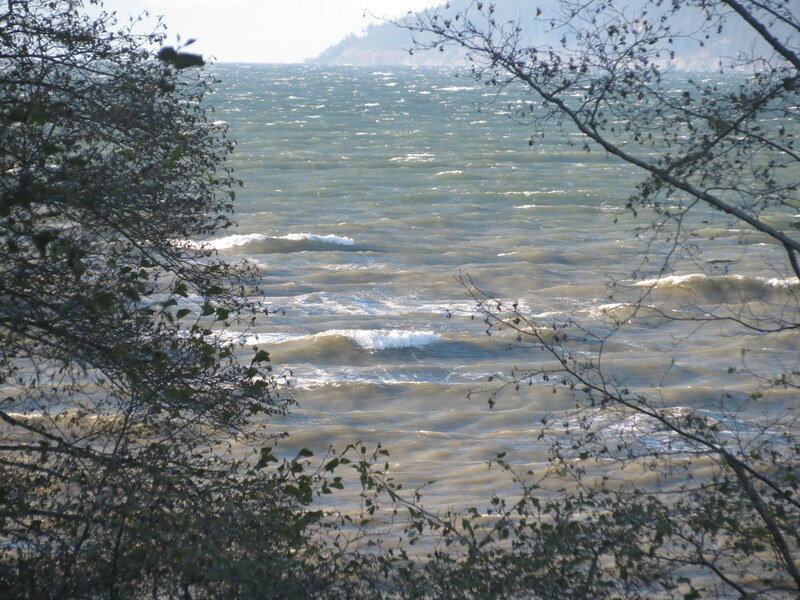 There can be a wind shadow (photo credit: Richi) here particularly on a southwest or west wind (a short swim may be needed to get the wind on a high tide). There are also large bounders at both ends of the cove and there can be shore break (use caution on mid to higher tides). Upper Acadia: Walk to the west along the path past the outhouse. 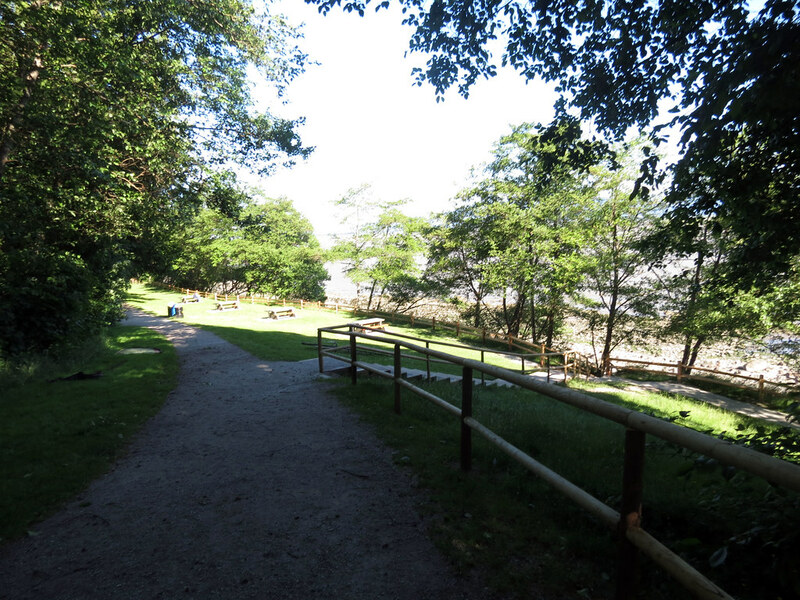 Once the path narrows, proceed along a few more metres until there is a break in the bushes where you can access the beach. 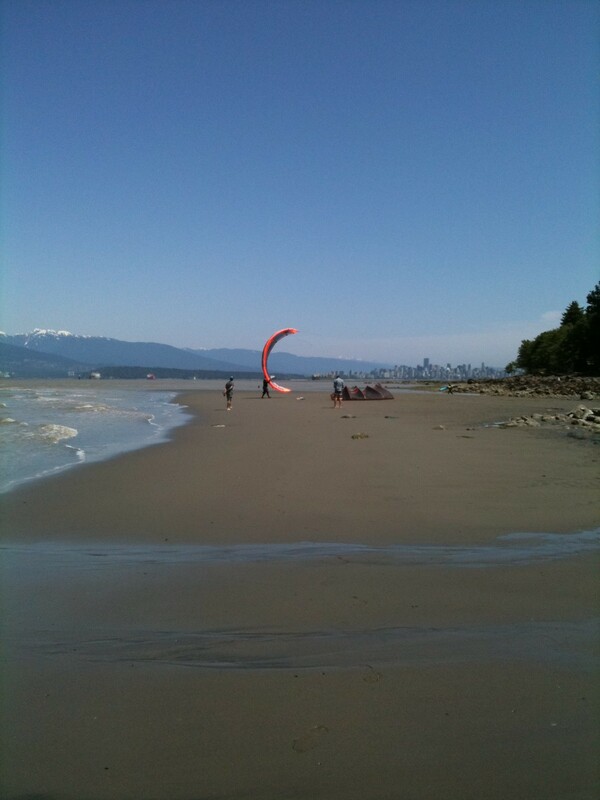 This is a nice place to launch as there is clean wind at the beach (no wind shadow) and you start upwind of the cove. 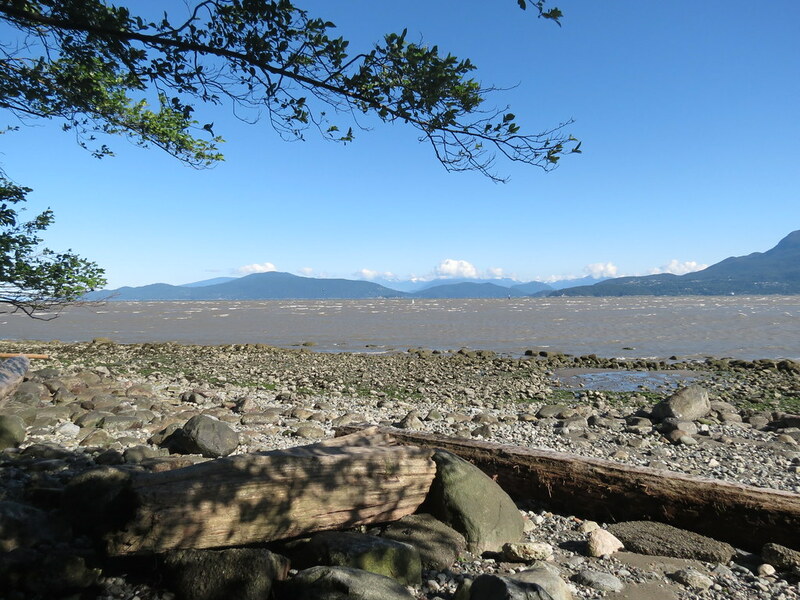 Beware of the large boulders just to the right of the launch (they can be covered with water on higher tides). 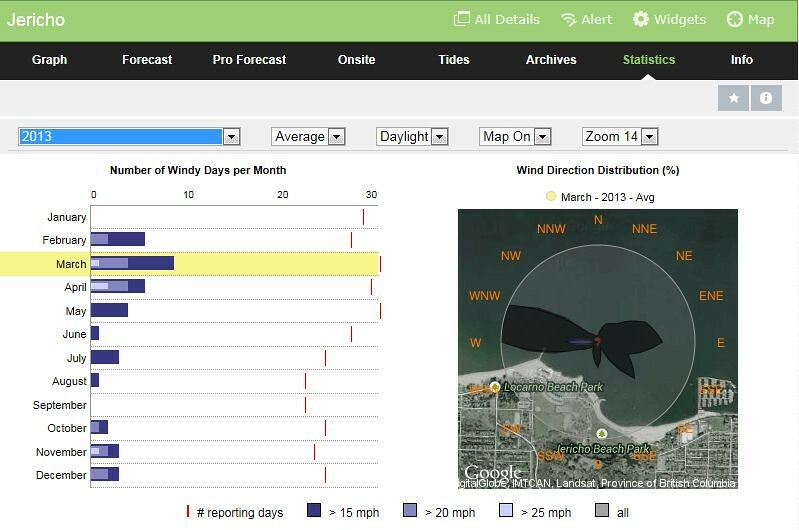 Point: Clean wind and even further upwind and no large boulders along the shoreline. 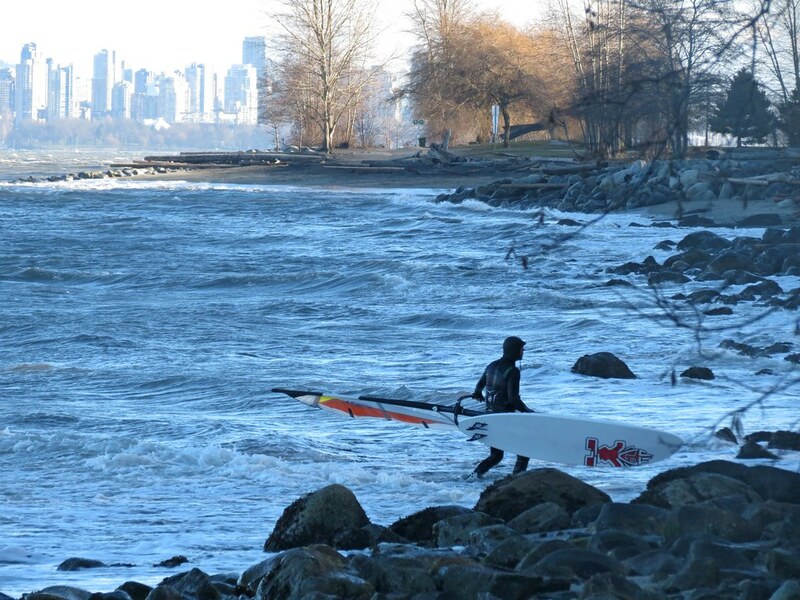 Shore break is usually very manageable. 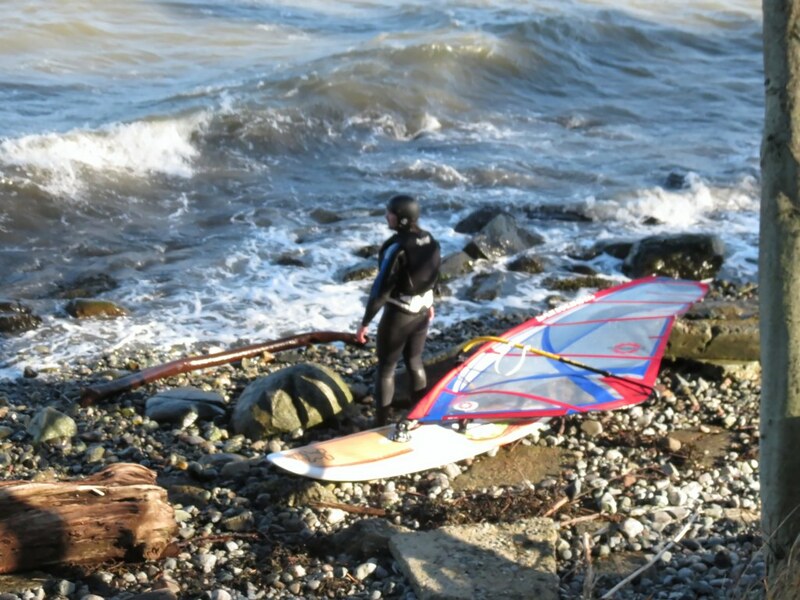 It can be best to use this launch on high tides when the other two have large shore break. Kites can only launch at Acadia when the bank is exposed enough to stage kites on the bank itself. If the surface pressure analysis shows a daisy-chain of low-high-low pressure systems there a chance of a classic clearing wind (good). Good solid wind to the west/northwest and you see clear skies and a few light grey cotton-ball-like clouds over the north shore. 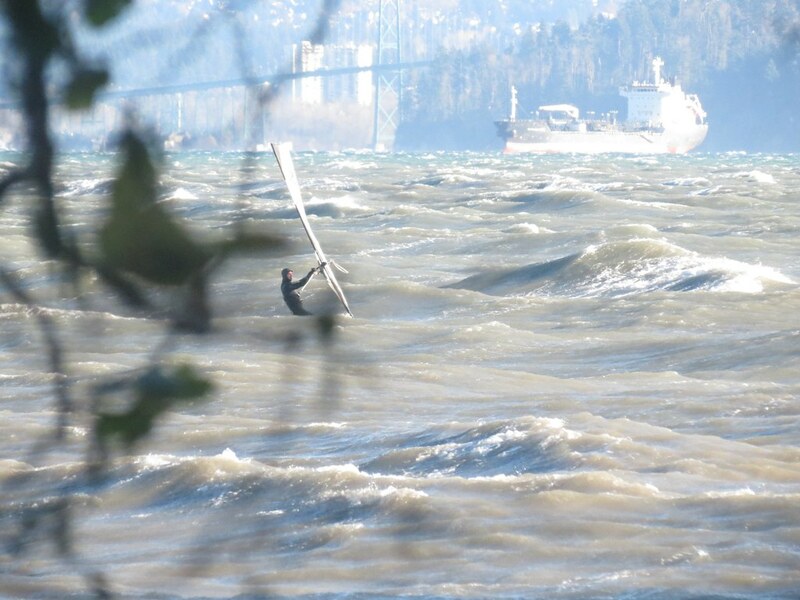 If there is northwest wind in the straight and its not filling into English Bay head for the Tsawwassen Ferry Terminal or Gulf Road in Point Roberts. 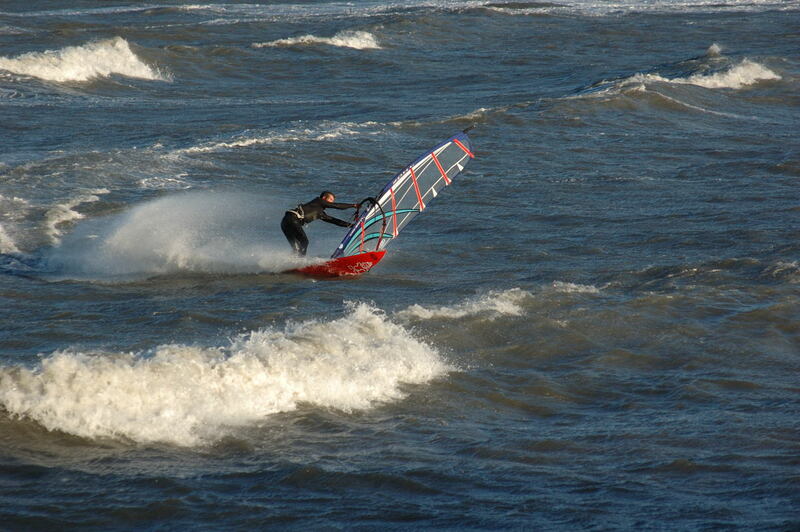 Watch for the kite boosting air at the top of the frame at 5:20. 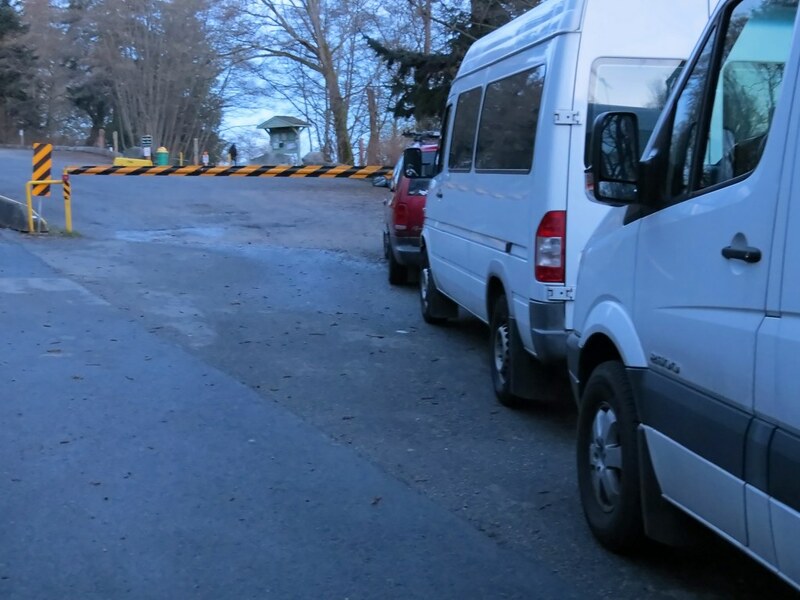 Thanks to Metro Vancouver for operating this park. Thanks to Elliot E, and PeterG for sharing their local knowledge. Last edited by C36 on Tue May 10, 2016 4:52 pm, edited 6 times in total. Thanks Dave, great information on Acadia. I'll print this article too (already printed the one for Centennial), lots of valuable information. You are so awesome Dave. Thanks for all these site infos. amanlig wrote: ...Thanks for all these site infos. gabrielb wrote: Thanks Dave, great information on Acadia. I'll print this article too (already printed the one for Centennial), lots of valuable information. Thanks for the comments. Glad you find them helpful! GB: Now you know how we feel about all the surfing info you have shared with us!